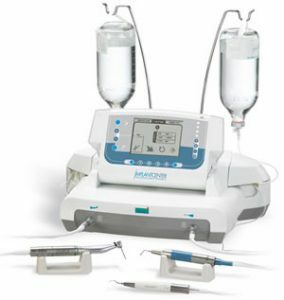 Mectron`s piezon-electric surgery system can be used for osteotomies and osteoplasty in implantology. Additionally it can be used in periodontal, endodontic and surgical orthodontics. It`s selective cutting action allows for mimimal soft tissue damage, especially useful for opening sinus windows during lateral sinus lift procedures. This unit comes with an array of handpiece tips designed for an array of surgical procedures.